As you get older, sometimes you become less independent. Physical or mental diseases or decline take away your ability to do many of the tasks you once took for granted. This process is often very difficult to accept. It causes a lot of questions and heartache. But, there is no shame in asking for or accepting help if you need it. For example, if you have trouble eating because of physical limitations, you need to look for ways to help. This is important because problems with eating cause serious issues with your health and quality of life. Fortunately, there are a number of aids which help with eating. Special plates for elderly people are designed to help people with physical difficulty keep their ability to eat independently as long as possible. Why do Some Elderly People Need Special Plates? Most people take eating for granted. It’s something we do while talking or while watching television. Using a knife and fork is automatic. But, when you’re a senior with weakness due to illness, eating is difficult. Tremors in the hands can make food go flying. Arthritis makes it painful to even hold your cutlery. As if that wasn’t bad enough, declining vision plays a role. This makes it difficult for you to find your food. Often leading to you pushing it over the edge of the plate. Having trouble feeding even affects your overall nutrition. There are a lot of things that can go wrong in this most basic of daily care tasks. That’s why there is a variety of aids on the market that can help no matter what limitation you have. These aids can’t remove your physical challenges. 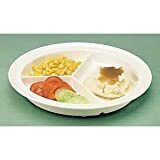 But, plates designed for seniors will allow you to independently enjoy your food. That’s the important part. Are they easy to clean? Normal ceramic plates may look good but they’re often difficult to clean. Plates that are designed for seniors are usually made of plastic. This makes them easy to wash and dishwasher safe. This is a real bonus if you have to do your own dishes after eating. Family members and caregivers will appreciate this too. Will they break easily? People who have trouble eating usually have weaknesses in their hands or wrists. This makes it difficult to hold cutlery as well as getting the spoon or fork to their mouth. Unfortunately, these types of physical problems lead to a lot of plate breakages. This usually happens during washing or while moving the plate from a counter to the table. Many plates designed for seniors are made of plastic which is sturdy and hard to break. This is a big help if your plate tends to move a lot and even falls off the table while you’re eating. Even if you do drop the plate, at least you won’t risk injury or even a fall by picking shards of ceramic off the floor. This is an important part of kitchen safety for elders. So, what’s the verdict? For most situations, plastic plates are probably best. High edge in the back to keep food on the plate with non-slip surface. Microwave and Dishwasher Safe. Scooper bowl with deep edges and a non-slip silicone mat to reduce messes. Complete set of dishes for elderly to easier eating and less mess. Basic scoop plate with sections to keep food from mixing. Aggressive partitioned plate with deep sections. Includes lid for advance meal prep and storage. Deep scoop bowl with a suction cup bottom. Prevents plate from moving and tipping over. Some seniors have trouble picking up food off of a plate. They chase it with their fork and often push it off the edge of the plate. This is not where you want your food of course. And, it causes a mess that has to be cleaned up. There are a variety of plates that can help with this issue. The most basic walled plate has raised edges to keep the food on the plate. This is very helpful if you’re eating foods like pasta. Or, if you are the type that likes to mix foods together. These walls won’t totally prevent the food from falling onto the table. But, they are a big help for picking up slippery or awkward foods. There are also aids called scoop bowls and scoop plates. These have a high raised edge on half the plate. But, the front of the plate is lower. This type of plate helps elderly people scoop the food onto their fork or spoon by pushing it towards the back. Having the open front makes it easier to use too. This plate has all my suggestions for improving independent eating for seniors. It has a high edge to help with getting food on the utensil. This also prevents a mess by keeping the food on the plate. It is also large enough to get an adult sized portion of food on the plate. Also, unbreakable and dishwasher safe! This is another of my recommended scooper bowls. This one has the added bonus of a silicone mat. 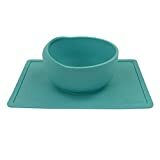 The mat keeps the bowl from moving while the elderly person is eating. This makes it easier for the senior and could prevent a mess too. It is microwave and dishwasher safe too. 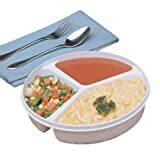 GET ADULT PORTIONS - The large capacity bowl (33.8oz) allows you to serve and eat adult sized meals. If you would like to have a once and done solution for helping elderly people eat, here it is. This complete table setting has all the products needed to serve and consume a full meal. While I don’t know if I subscribe to the whole red plate theory, I do know that this set is very helpful regardless of the color. Images, Ratings, & Prices from Amazon Product Advertising API - Updated on 2019-04-20 at 02:04 - contains affiliate links (see footer). 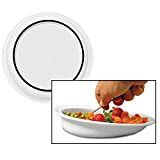 You can also get plates that have partitioned compartments to keep different foods separate. For some, this option is a little more difficult to use. Your spoon will constantly be running into the raised edges. But, these plates are a good choice if you want to keep your foods separate. This is the case for elderly people who have to eat soft or pureed foods. They are also useful for people who have vision problems. Each type of food is kept separate from the others and easy to find. This partitioned plate also has non skid feet on the bottom to keep the plate from moving. Like I’ve discussed this is important for reducing messes and helping to keep the food on the plate. The section walls are helpful for people with moderate problems. But, people with severe challenges will probably need a deeper plate like the one below. Made of Melamine and should not be microwaved. This sectioned plate has nice, deep walls that are an 1-1/2″ high. This ought to really help keep food where it belongs. Even for elderly with more advanced needs. It also has a lid for storing foods for later or preparing meals in advance. Remove the lid and pop in the microwave for an easy meal. Also, dishwasher safe for easy cleaning. Sometimes it’s not just the food that ends up all over the place. Tremors may cause the plate itself may skid across the table. This is a very slow and tiring way to eat. Weighted plates help because they are heavier than normal plates. They are also usually made of a thicker material and insulated to keep the food warm. They are also a good option for seniors who have less control over their hands and end up pushing plates off the table. However, weight plates are heavier and may not be a good choice for seniors who do their own cleanup or have the carry their plates. There are other options for skid-free plates. Some have rubber patches on the bottom. Others use silicone mats in combination with a rubberized bottom. The Scooper Bowl above is my favorite non-slip plate and it uses this system. Another good option to try is plates or bowls that have suction cup bases. Especially when you need an aggressive solution to moving plates. These “stick” in one location to help ensure your plate stays where you want it. These may be a better option than weighted plates. They are lighter and easier to pick up and clean. This eating aid combines the function of a scoop plate with the reduced movement of a suction cup. It is an ideal solution for people with tremors or spasticity from Parkinson’s, cerebral palsy, or paralysis from a stroke. The food may be get mixed together while using it if this is an issue. Dishwasher and microwave safe. Hit it! ...Bump it! ... Push it! ..... It will not move or tip over! Getting older is difficult. Many of the basic activities of life that you once did so easily become harder. And, now, you must accept more help with day to day activities. It’s important to accept the help you need. It is important to continue your regular eating pattern. This will both improve your life and keep you stay safe and healthy. But, it’s also important to stay as independent as you can. Tools like special plates for elderly people allow you to perform normal everyday activities. Preparing foods may be simpler by using lightweight pots and pans. Sometimes, a nice easy to use microwave is better for cooking. These devices help you work around your limitations. If eating from a standard plate is causing you trouble, try some of these options. If spills are happening from drinking, check out these spill-proof cups and lightweight coffee cups for seniors. They might just give you the help you need while still allowing you to maintain your independence. Do you have any other suggestions on how seniors and elders to make feeding easier? Or even safer? Your suggestions are welcome in the comments below. Questions, of course, are welcome too! Thank you for this website! I am crying with joy to have found you. My mom is almost 90 and recently is needing to have everything pureed. It became challenging and you have given me guidance that is very much appreciated. Wow – thanks Ilana! This is exactly the reason I work so hard to provide this information to people. Improving the quality of life for our seniors is very important to me. My way of giving back you know?!? Thanks again for your comment and best wishes to you and your mom!